A visit in Zurich would not be complete without a Zurich Lake ferry ride. Some just make it by hopping in to several stations but to make the most of it you have to travel the whole way from Zurich to Rapperswil, the scenery is amazing and is an eye candy in every direction. The whole ride will take you two hours but you will not notice it as you are busy sightseeing and looking at the different shoreline scenery the Zurich lake is offering. Best time to get a ferry is just before 10 AM so you are right on time for lunch on the other side of Zurich Lake, Rapperswil. The ship docks directly in the Altstadt (“Old Town”) so you don’t have to walk really far to find something, from the medieval alleys, the Rapperswil Castle and to the St. John’s Church. Restaurants as well are just in front of the docks, very accessible for the passengers like us. I guess by now if you are following my blog, you would notice that what love eating most in Europe, if not I will tell you now it is pizza. This lunch is nothing different hence the first pizza restaurant we saw was the place we had our lunch. 10 Deici was the restaurant, we so missed the sun as we left in the middle of winter in New Zealand so we sat outside al fresco even though Filipinos are known to hide from the sun. We then ordered and what strikes me most after looking at their menu was their Deici pizza, it looked big in the picture but most importantly it is loaded with Prosciutto. Before we go with that pizza, let me tell you what other items we did ordered as well. 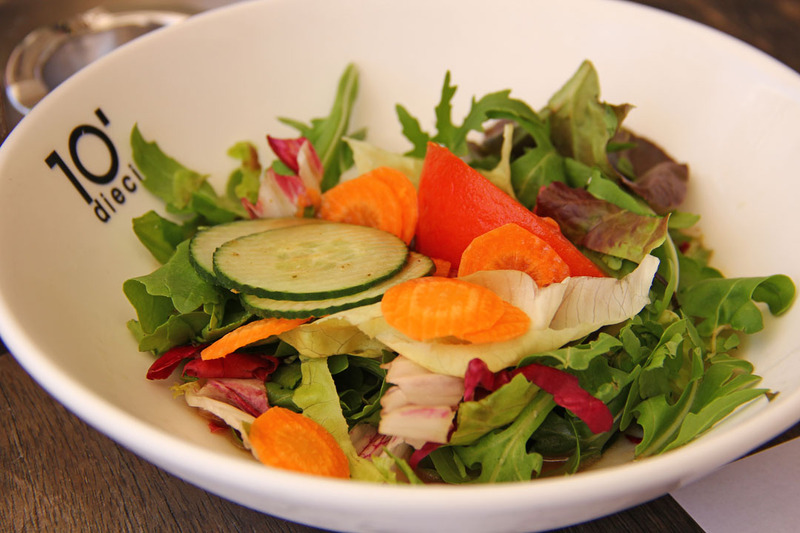 First was a normal green salad (CHF 7.00), nothing really special, it looks like your normal salad and tastes like your normal salad. Then we had the Bolognese pasta (CHF 18.00) which is your normal pasta with minced meat in tomato sauce, it tasted good and seasoned well. Then at last my daughter found a Hawaiian pizza (CHF 19.00), after nearly one month looking for it across Europe. She was really happy and ate almost half of it. Finally the single item that made all of what we ordered normal, the Dieci pizza (CHF 46.00). I never thought it would be as huge as this one, it occupied more than half the width of a fairly large family outdoor table. The size might be impressive but the taste is even more amazing, this is a pizza done right from the base to the toppings. 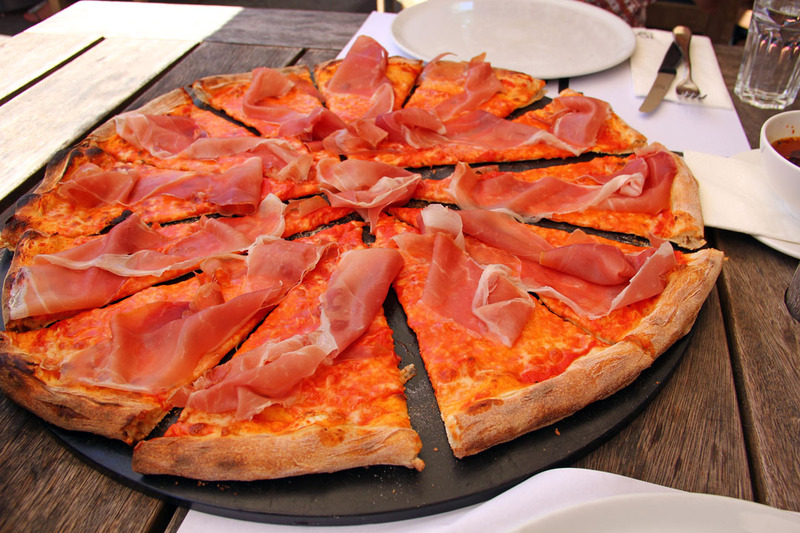 The pizza has a thin base with crispy bottom and chewy on top, there is a good amount of mozzarella hidden beneath the thinly sliced San Daniele Prosciutto, adding to that there is also some lumps of mascarpone in between. This pizza in fact is enough to feed three hungry humans! Well after that we had a lot of leftovers and we are full to the brim ready to do a lot of walking around Rapperswil with happy faces giving evidence to a very satisfying lunch. I find it mind-boggling that you had a hard time finding the Hawaiian pizza, I know you’ve mentioned it before in your wonderful Friday recollections of what you ate in Europe and still can’t come to terms with it. 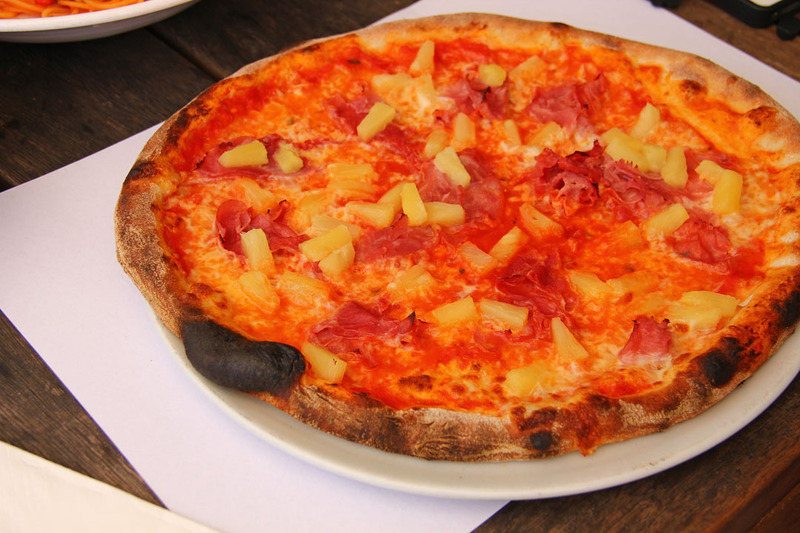 Hawaiian pizza is EVERYWHERE in Europe! I have never been to a pizza place that doesn’t have it, ever. 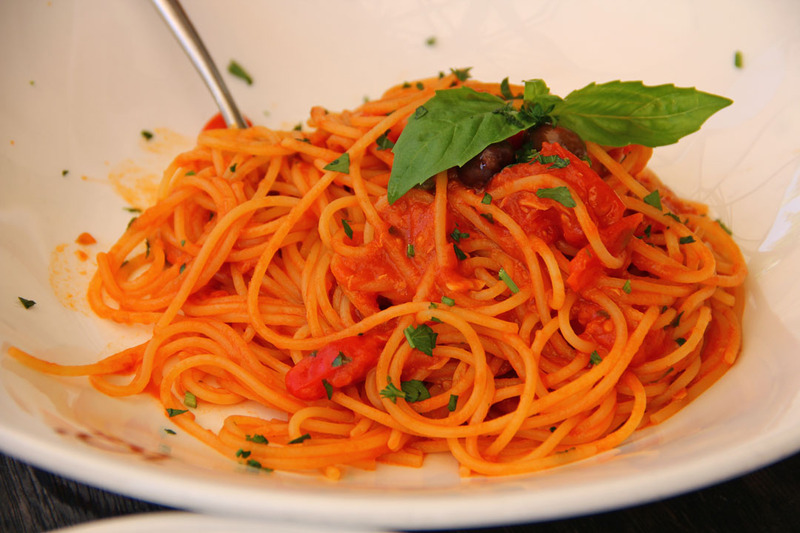 I’m from Spain, have lived in Germany and UK and have visited or spent time in quite a few countries in the continent, and because pizza is so delicious, inexpensive and readily available everywhere I do have a lot of experience in Italian restaurants and pizza takeaways. I know it’s everywhere because I hate it, and sometimes they don’t have my favourite combination of ham and mushrooms, but sure as daylight that they always have the pineapple one, and I always complain about it, haha. I guess you’ve been unlucky? I’m sorry for your daughter, but glad in the end she found a place where this pizza was served and could satisfy her craving. Yeah I think we were unlucky, honestly this was a hard to find flavour. At least she had her second choice always and yes pizza everywhere we ate was yummy! Hawaiian may be old school but it’s one of my favourite pizzas. I love pizza! Haven’t had a Hawaiian one in quite some time, but that’s a classic. You certainly travel to fun places – it’s a pleasure reading about them.